I hope you’re all enjoying some nice weather and some down time today. If you’re planning a last-minute BBQ for a small crowd, this is an awesome side dish option. I’ll be serving it along with some bourbon glazed steaks later today! Cook the bacon in a large skillet until crisp. Remove from the pan and drain on a paper towel until cool, then crumble. Remove all but 1 tsp of bacon grease from the pan. Add 1/2 teaspoon of olive oil, once the pan is hot, add the onion slices. Sauté until caramelized, about 20 minutes, making sure to stir frequently. While the onions are caramelizing, par cook the fingerling potatoes in a pot of boiling water over high heat, for about 10 minutes or until fork tender. Remove from water and let cool. Once the onions are caramelized add the minced garlic to the pan and cook for an additional 60 seconds, stirring constantly, remove from skillet and set aside. Slice the fingerling potatoes in half lengthwise. Add the last 1 1/2 teaspoons of olive oil to the same skillet over medium heat, once hot, add the fingerling potatoes. Cook for about 5 minutes then flip, cooking for an additional 4-5 minutes or until golden brown. Add the bacon crumbles, onions and garlic to the pan to reheat. Top with fresh chopped parsley and serve. Yum! 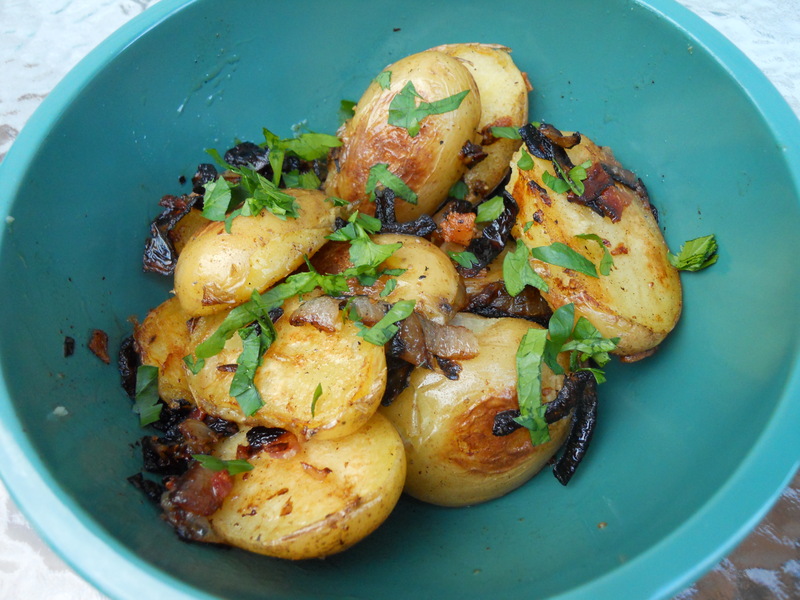 I love potatoes and these sound extra delicious with the onions and bacon.